HASLETT, Mich.– Inspired by the support of comic conventions throughout Michigan and driven to provide the local community with a similar opportunity, a covert group of like-minded Lansing professionals known as the Phantom Five have founded the Capital City Comic Con (C4). 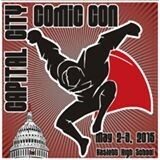 The Capital City Comic Con will be held Saturday and Sunday, May 2-3 at Haslett High School. The convention will sprawl the north end of the school, utilizing two gymnasiums, the 700 seat performing arts center, dressing rooms, expansive hallway and cafeteria space, and more. Officials anticipate hosting between 2,000 - 3,000 attendees over the course of the weekend with space to accommodate more than 50 multi-media exhibitors, including vendors offering comic books, board and card games, action figures, merchandise, videos, apparel, and more. In addition to exhibitors, the convention plans to incorporate special guest graphic artists and writers, costume and cosplay competitions with local celebrity judges, performance art, improvisational and interactive cosplay, panel discussions and other activities throughout the day. Sponsors include Graff Chevrolet, Granger, Schuler Books and Music, Gearhead Fuel Injected Brews, Spartan Printing, local area cinemas and more. “This will be a fantastic family-friendly event debuting on Free Comic Book Day and the opening weekend of the new Avengers movie,” said Louney. Barr, whose past event planning experience includes Lansing’s massive weeklong Common Ground Music Festival, says the founders are taking a conservative approach with event plans to ensure a seamless event. Capital City Comic Con is greater Lansing’s first comic convention, bringing fans from all walks of pop culture together for a weekend of fun for fans of all ages. The Phantom Five is comprised of Christina DeJong, James Curtis, Malinda Barr, Randy Chapel and Dennis M. Louney. For more information or to purchase tickets, visit www.capcitycomiccon.com,. Exhibitor registration is now open and also available online.